The exquisite, hand hammered and hand tooled copper designs of this handcrafted, Spanish colonial style headboard are wonderful examples of the talent of our skilled craftsmen. The headboard has a solid wood, rectangular frame, with a staggered, top molding. 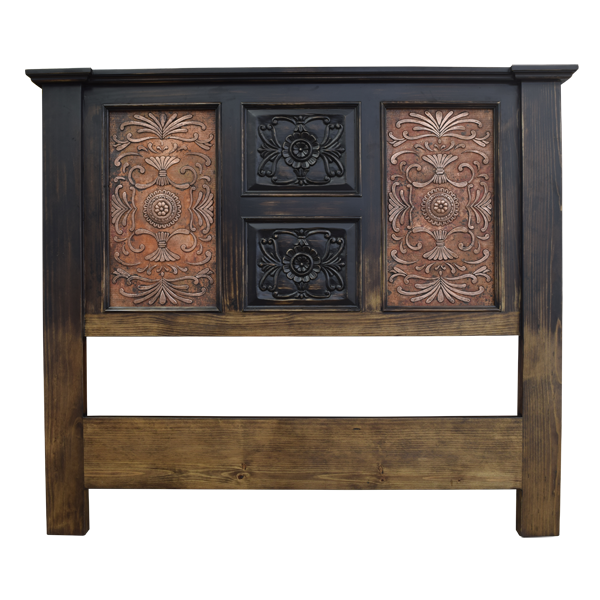 On each side of the front of the headboard is a vertical, rectangular, hand hammered, copper panel, and the panel is enhanced with a centered, hand tooled, copper, floral design. The floral design is surrounded with luxurious, hand tooled, copper, floral and scroll details. Centered in the front of the headboard are two, horizontal, rectangular panels, and each panel is adorned with a centered, hand carved, floral design. The floral design is accompanied by marvelous, hand carved, floral and scroll details. The headboard is framed with solid wood uprights, and each upright is accented with a staggered finial. It rest on square cut legs and it has a lovely, antique finish. The headboard is made with the best, sustainable, solid wood available, and it is 100% customizable.